The best pregnancy test of choice for early testers are Wondfo pregnancy tests because they’re super sensitive, inexpensive, and can be ordered online easily. Because these tests are susceptible to evaps and false positives, if you get a positive on one of these, you may want to back it up with a more expensive but more reliable test like a FRER or Answer or a digital test. With Amazon pricing as low as just $35 for 100 tests, these Wondfos will give you the best bang for your POAS-addicted buck! The First Response Early Result (FRER) tests run about $4-$4.50 per test at Amazon and can be taken 5 days before your period is due. Since these tests are more expensive you may want to use internet cheapies for your early testing and if you get a positive, confirm it with one of these. Do the math on multi-packs before buying, sometimes buying 2 is cheaper per unit than buying 3 at Amazon. 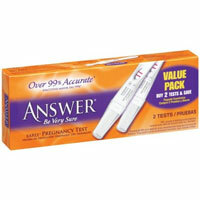 The Answer pregnancy tests are a little less expensive than FRERs and just as accurate. The box claims detection as early as four days before your expected period. If you buy in bulk and use Subscribe & Save, you can get them for as low as $4-5 per test at Amazon. There are a few different types of digital pregnancy tests on the market and they’re all pretty much the same. The Clearblue Easy Digital runs about $5-6 per test at Amazon and the box claims you can test 4 days before your expected period. New digital pregnancy tests include a conception indicator, like the Clearblue Digital Pregnancy Test With Conception Indicator which also can be used 4 days before your expected period. 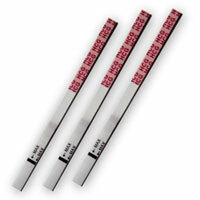 For positive results, the test display will show you a very clear Pregnant readout and how many weeks since conception. SMEP: Sperm Meets Egg Plan powered by WordPress and Jenny.